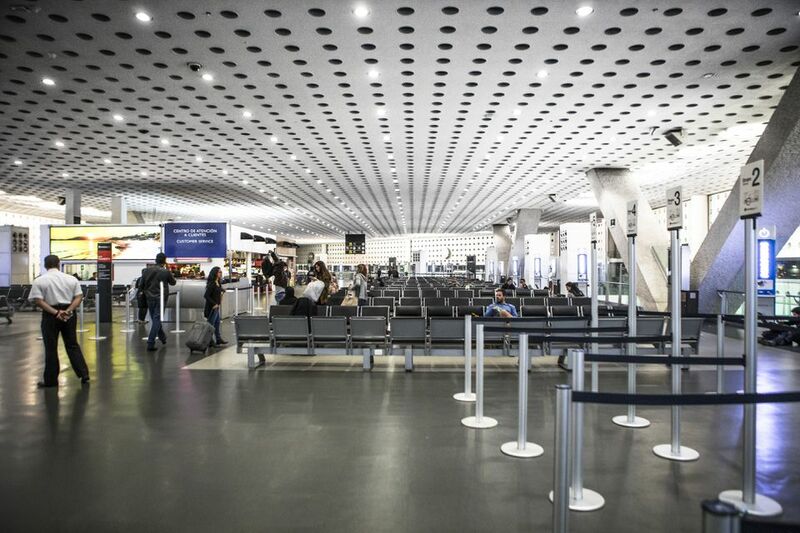 Mexico City's international airport is the main gateway into the country and many travelers land there before taking connecting flights to their final destination. This modern and efficient airport receives more than 40 million passengers each year. You may find long line-ups for customs, and the airport's linear design can make for a lot of walking. Be sure you have plenty of time to find your way between connecting flights, especially if you have to go through customs and/or change terminals. The Mexico City airport has two terminals. AeroMexico operates out of Terminal 2 (T2). Most flights with other airlines arrive and depart from Terminal 1 (T1). To travel between terminals, there are two options. Travelers with flight tickets or boarding passes may use the free light rail called the Aerotren, which runs every 15 minutes between 5 am and 10 pm. Anyone may take one of the bus shuttles running between the terminals that charge a small fee. You'll find the bus shuttles near Puerta 6 in T1 and Puerta 4 in T2, and the Aerotren by Sala D in T1 or Hall M in T2. Within the airport, there is a wide selection of restaurants, bars, and fast food outlets as well as over 160 shops. You will also find banks, ATMs, and currency exchange booths as well as options for car rentals, and tourist information desks. Find out about options for WiFi at the airport. Departure gate numbers are usually announced only thirty minutes prior to boarding, so be aware of the time and check the departures screens for your gate number to be sure to get to your gate on time. The international arrivals gate is located at the far west end of Terminal 1. There are luggage carts in the baggage retrieval area but these are not allowed past the arrivals gate. There you will find porters anxious to help you with your luggage (charging per bag depending on the size and how far they have to carry them). Mexico City's airport is located about 8 miles (13 km) east of central Mexico City. Travel time will depend greatly on traffic, so be sure to leave plenty of time to get there before your flight. By taxi: There are authorized taxi stands inside the airport where you can buy a ticket to your destination (look for the stands that say "Transporte Terrestre" and then proceed outside to the taxi line to catch the taxi. By metro: If you're not carrying too much luggage, the metro is a good option to get to and from the Mexico City Airport. The metro station is Terminal Aerea on the yellow line. Long-distance bus: There are direct long-distance buses to and from Cordoba, Cuernavaca, Pachuca, Puebla, Querétaro, Toluca and Tlaxcala. Look for signs that say Transporte Foréano/Terrestre at either T1 or T2. The Hilton Mexico City Airport is located on the third level of gate F1 in the International arrivals area. Read reviews and get rates. The Camino Real Mexico Aeropuerto is across a pedestrian skywalk from terminal B. Read reviews and get rates. The Courtyard Mexico City Airport is located off of Terminal 1 (walk over the sky bridge to reach the hotel) and offers free shuttle service to and from Terminal 2. Read reviews and get rates. The Fiesta Inn Aeropuerto is located about 5 minutes from the airport and offers free shuttle service. Read reviews and get rates. If you have a layover in Mexico City for several hours, check out a few of Mexico City's top sights!